PASADENA, Calif. – Let’s salute the big winner in sports Tuesday. Kudos to Premier Sports Management of Overland Park, Kan.
That’s the consulting group the BCS hired to help name and brand its long-awaited college football playoff. The winning name: College Football Playoff. I figure the folks at Premier Sports spent 15 minutes on that job, then called it a day and hit the golf course. Next day they put in a solid 30 minutes coming up with four clunky logo choices and one populist brainstorm – let’s have the fans vote for the logo of their choice! – before going fishing. For their tireless efforts they cashed what is presumed to be a fat BCS check. The minimalist, literalist triumph that is College Football Playoff left even the commissioners and athletic directors here at the BCS meetings smirking. They know the name is something a kindergarten class or Ryan Lochte would dream up. They don’t really care, since the trappings are far less important than the reality of a more legitimate way to crown a champion. No punch line. College Football Playoff, to be televised by Massive All-Sports Disney Subsidiary and perhaps sponsored by Football-Friendly Tortilla Chip Company, is for real. The goal seemed to be coming up with something so prosaic, so leadenly obvious and so utterly bland that the moniker couldn’t be made fun of. Aside, of course, from making fun of it for being boring. But boring is better than some other alternatives. Look what Legends and Leaders got the Big Ten – a two-year succession of mockery, as Joe Paterno and Jim Tressel helped undermine the smug division names. No wonder the league is reportedly changing the names to East and West, following the safe geographic footsteps of the SEC and Pac-12. So the BCS thought it over and decided grandiose was out. Highfalutin was out. Creative was out. Potentially dicey acronyms were out (we were told the name is not to be shortened to initials or, well, there will be big trouble). Lame as the name is, it’s not the only literal one out there in sports. The NBA Finals is pretty elementary. So are the AFC and NFC championship games. Stodgy old baseball, with its World Series and pennants, and hockey, with its Stanley Cup, look positively flowery by comparison. 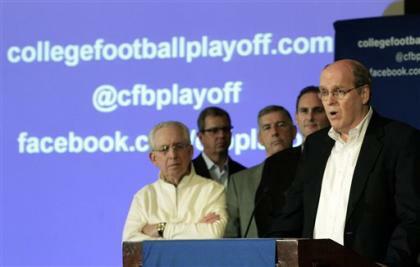 Clearly, the main thing the college football power brokers wanted was a clean and decisive break from the BCS Era. Those letters had become too toxic. It was time for a Soviet-style renouncing/cleansing of the past. Out is the word “bowl.” In is the word “playoff.” That was a clear acquiescence to public opinion. These are men who refused for years to even utter the p-word; now they can’t make it prominent enough in their business. 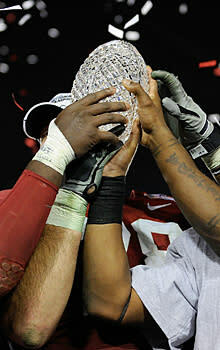 Slive acknowledged that the crystal football, token of titles won during the BCS Era, is likely gone as well. Whoever wins it next January will almost certainly have the last of its kind, before a new trophy takes its place. As Scott pointed out, this is all going to work out over time. The drama will be in the details, not over the name. College Football Playoff. Only Captain Obvious is impressed by the name, but just about everyone is happy to have the minimalist triumph one step closer to reality.